Working With a Blog Photographer: Everything You Need to Know! There's one question that I've been asked more than others from reader friends over the last year and a half-ish... and that is is anything related to the photography aspect of running my blog! The specific wording of the question itself varies person to person, but I've had a lot of inquiries as to when I first made the decision to hire a blog photographer, how I've found my photographers (in both NC and VT), and other questions related to blog photographers. After being asked some of these questions again when I did my Winter 2018 Reader Q&A post last month, I decided to save any photography related questions and finally just write a whole separate blog post about it all! 😊I hope this is helpful to you, and if there's anything related to this topic that I didn't touch on, please feel free to email me. *When did I start working with blog photographers? There are actually two answers to that question! In my first couple years of blogging, I had the chance to do a few random shoots with photographers that I met through a Facebook group. I didn't pay for any of these shoots, and they were all kind of to help these girls build their photography portfolios for fashion imagery. (The cool thing is most of these photographers have gone on to be super successful full-time wedding photographers now, hard work pays off!) So technically speaking, I did work with a few photographers early on. But during my first three years of blogging, it was 95% of the time my college roommates and friends who would take my blog photos and Instagram pictures, and I'd edit them myself. As I neared college graduation in 2016 and 4.5 years of blogging, I was ready to take the plunge and hire my first photographer for a more permanent relationship. Part of that was because I'd soon be parting ways for living with my current college suitemate, who at that time had been doing most of my photos. I didn't want every time that we saw each other after my graduation to only be due to my blog! I was also finally at a place where I was making a small but steady monthly income from blogging, and I knew that I could afford to pay for a blog photographer with my earnings. This is an important one! And lastly, I consider myself to be a self-proclaimed blog photography snob and I wanted to take Southern Belle in Training's images to the next level. There was only so much I could do with friends who didn't have photography background taking my pictures and my minimal editing skills. I knew with better consistent images, I'd land more sponsored campaigns (and that's totally what happened!). *How do you know whether to use someone you know (boyfriend/husband, family member, friend) for photography needs, or hire a photographer? Long answer- I apologize in advance! This decision is different for everyone! My process was using my Kodak digital camera and iPhone for the first two years (lol- but true! ), my new DSLR for years three and four, and then I started working with photographers for about 80% of my blog content in 2016, after 4.5 years of blogging. I still use my DSLR when I travel, and for some last minute blog posts or the occasional outfit posts that I shoot in between sessions with photographers. (I also enjoy photography as a hobby, so now I have the chance to use my DSLR more for fun photography than just my blog!) Most newer bloggers take a faster path to monetizing their blogs than I did, so chances are you might not be using a crappy digital camera for your first two years. My best advice, which I kind of mentioned above, is to not hire a blog photographer regularly until you can pay for that 100% with money from your blog. Trust me- I could not afford to work with my photographers regularly right now on my salary from my day job, especially with high rents in Vermont and student loan payments! But I am proud to work hard enough on the blog since 2016 to pay for it with business earnings and write it off for taxes each year as a business expense. Once you're at that point with your earnings, I highly recommend a photographer! If you are earning enough with your blog to afford a photographer, I personally advise to do that over using someone you know. It is great to have a person in your life who is willing to help out with your blog- trust me, I am so thankful for everyone I knew in college who took my photos for me on that digital camera way back when, haha! But I think there comes a point with blogging, especially when you're doing more regular sponsored work and starting to have a lot of deadlines, that the photography aspect of blogging becomes less casual and more like "work," and you don't want that to affect your relationship with this person. My Vermont blogging friend Nicholle helps me occasionally with sponsored blog post photos if I have deadlines that don't correspond with my photoshoots, and I've written before that my parents help me with blog photos when I'm home in Maine or traveling with them, and other friends will still snap occasional Instagram pictures for me, but other then that I really try and keep things to working with my photographers! If I were to get in a relationship anytime soon, I can't even imagine having a "blogger boyfriend" - lol!! *How to know what type of photographer to work with? To some people, the term "photographer" conjures up childhood memories of very staged studio shoots in the mall in the JC Penney or Sears portrait studio.... eek! That's definitely not what it's like to work with someone for fashion imagery a blog. I personally prefer to work with natural light wedding photographers (all of my photographers have worked primarily doing weddings). I love bright and airy photos, and working with photographers who understand how to maximize using natural light. I've found that typically wedding photographers understand that well! However, your aesthetic on your blog might be very different than mine, so you might prefer to work with a different type of photographer. Browse lots of portfolios and see whose images you connect with. *How did I find my blog photographers? I've had three photographers that I've officially "hired:" meaning I've signed a contract with them and have used them longterm. One in Charlotte, Deeana Kourtney Photography, and two here in Vermont, Melissa Lynn Studios and Amanda Rose Photography. I found Deeana and Amanda through the same way, a great community-building organization for creatives and entrepreneurs called Rising Tide Society. Rising Tide Society has meet-up groups for creatives in all industries called Tuesdays Together groups in almost every city across the country, and I found both Deeana and Amanda through local Tuesdays Together groups in Charlotte and Burlington! I've found in both states that I've lived in that Rising Tide Society has a majority of photographer members as compared to other creative fields, but anyone that's a creative entrepreneur is welcomed (so as a fashion blogger and content creator, I was eligible to join Tuesdays Together groups in both places I've lived!). Once I was added to each region's Facebook group, I put out a post describing a bit about my blog, and what I was looking for in a photographer. I found Deeana that way in the Charlotte group, and Amanda in the Burlington group! Here in Vermont this summer I also got to attend a few of the meet-ups for Tuesdays Together, and it was a fun way to meet other photographers and creatives in the Vermont area when I was brand new here. I found Melissa through The Knot- the popular wedding website! The Knot has a section where local vendors can list themselves, and while I was still living in North Carolina I used this to search for Burlington area wedding photographers, so that I'd have one lined up before I moved. Deeana was primarily a wedding photographer at the time we worked together, so I figured that using another wedding photographer would be the way to go in Vermont. I browsed several portfolios that were listed for Burlington on The Knot, and made a few email and phone inquiries. Some were too expensive and some weren't interested in working with a blogger, but Melissa ended up being a great fit! *What are some additional ways to connect with blog photographers? 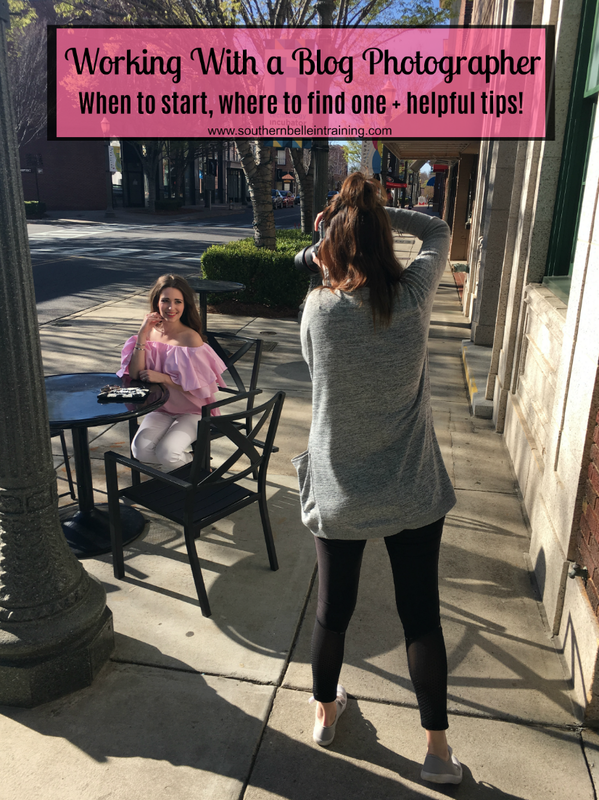 While I haven't personally used these ways myself to find a photographer, I might try them in the future and I've heard of other bloggers using them! If you don't have as big of a budget to work with a photographer, try reaching out to the dean or a professor of a local art school or university with a photography major, and ask if any students would be interested in working with you on a trade basis to build their portfolios. And if Rising Tide Society or The Knot aren't working for you to connect with anyone in your area, try searching #(YourCityorState)Photographer on Instagram, or other local creative related hashtags!! Instagram can be such a great place to make connections. Lastly, if you're traveling and need a blog photographer only for a short time, try and find bloggers who already live in or have visited the area, and ask them who they've worked with previously and enjoyed! I'm always happy to recommend my Charlotte and Vermont photographers to those visiting these areas. A couple lines about your blog (the focus of your content, how long you've been blogging, how frequently you post, etc). Why you're looking to hire a photographer for your blog and what you envision the relationship to look like. What drew you to this photographer's portfolio and why you're interested in working with them. Conclude the email by suggesting a phone conversation or meeting for coffee if they're interested in working together, and end on a professional and upbeat note! *What things do you include in your contract? It is EXTREMELY important to sign a contract with your blog photographer, just like signing one with a brand! This protects both you and the photographer. The most important thing in all of my contracts are the timeline that I will receive photos from my photographers. Oftentimes when I shoot with them it's for a sponsored campaign, and I need the photos by a certain date. While most photographers can't always get your images done in a day, having some sort of a timeline of expectation for delivery in writing is so important. (FYI: from what I've seen in blogger discussion groups 5-7 days seems to be about the standard on this). The contract is also the place to agree upon the rate you'll be working with per shoot! Get this all agreed upon before you begin working together. *How does pricing work for blog photography? Every photographer will charge differently for working with a blogger- different factors play in like average costs of photography in that city, years of experience for that photographer, the types of shoots you'll be requesting as a blogger and how much editing they will entail, etc. On average, what I've seen in blogging groups to be the standard nationwide is between $100-200 per hour long shoot. Some cities have photographers charging more, and some places have photographers charging less. These rates seem to be the average. Work with someone who fits your blog income budget! My current hours at my day job here in Vermont are 11:30-7 weekdays, so that is very convenient for blog photos and natural light. I usually shoot Monday or Tuesday mornings right now, and sometimes Sunday afternoons after church! When I was in broadcasting school, Deeana and I used to meet weekday evenings in the warmer months, and then we did a lot of early weekend mornings last winter. *How often should you shoot with a photographer? Base this around your budget, and the amount of collaborations that you're getting! A full-time blogger will need to shoot more often then someone who both blogs and works full-time like I do. I currently shoot at minimum once a month, and sometimes twice a month if I have extra collaborations or outfits to share. I've heard though of some full-time bloggers meeting their photographers as much as 2-3 times weekly!! *Do you need to hire multiple photographers? This is a very personal decision! I probably never would have considered hiring multiple photographers until I realized how busy I'd be with my full-time job in radio, and taking on more sponsored work last year blogging. My first Vermont photographer, Melissa, had a very busy wedding season last summer, and there were some weeks our schedules were just not meshing. I knew that it was the best decision for my business to hire a second photographer, and Amanda came around at the perfect time! I love both of their work so I've continued to work with both ladies, and it's been so great. However, back when I was in Charlotte and had a different lifestyle, working just with Deeana was more than enough for my blog needs at that time! I will say that if you decide to hire more than one photographer, be transparent with your original one! (I love Melissa's photography and wanted her to know when I hired Amanda that it was for scheduling reasons mainly due to my own weird schedule with work, and didn't have anything to do with me not liking her pictures!) It's always better to be upfront about your needs in a business relationship then to leave someone wondering. Alright..... this post is now probably longer than some essays I wrote in college! Hopefully it covers everything and more that you've ever wondered about blogging photography. Thanks so much for reading!! This was a super informative post! I had always wondered about stuff like that. For me since I'm not a fashion blogger it's not as big a must have since now I have a super fabulous DSLR and my phone camera is pretty amazing. Thank you for this post! As a beginning blogger it was super helpful. Love your pink and white outfit in the picture...by the way. That has always been one of my favorite outfits that you have styled! I love trading services! I did my friends makeup for a shoot that our other friend (who is incredibly talented) was doing. We all promoted each other in exchange for the other's services. If you can't afford a photographer this is a great alternative! Thanks for such an informative post! Ahhh this was SO helpful to read! For some reason, the average cost of photography in Louisville is pretty high so I've always been super intimidated at the thought of trying to find a photographer even though eventually I know it's probably something I should do. So smart to use The Knot to find photographers that have the style you like too. Such great info! I haven't worked with a blog photographer yet but might try one out soon! Great tips! Getting a photographer really does ease the stress you have to get every shot perfect! These are great tips! I originally started out with a tripod and a remote and now my boyfriend takes my photos. It's been a fun learning process for us both but I agree that working with a photographer is quite a process and can be tricky! This was such a helpful post girl! Thanks so much! Love this post, Annaliese! Even though I've never worked with a photographer for the blog before, this is so helpful! These are awesome tips! I for sure have my go to photographer that I shoot with once a week! Great tips! I recently hired a photographer for my blog and it has been worth it 100%! No more stressing about editing or begging a family member to come shoot for me! Love this post. Let's hope Kyle doesn't get sick of taking my photos!! I definitley love how easy it is to just have him snap my pics. It helps that he does photography as a job though! Prerana | Broadcloth - Fashion for the Working Woman. 3 Ways to Get Nordstrom Gift Cards for FREE! Red and Pink Outfit - Happy Valentine's! What I'd Wear for February NYFW. Easy Galentine's Day Party Ideas.